Saint Fin Barre’s Cathedral Choir held a launch for their new CD of Christmas Carols on Saturday 25th November in the Cathedral. The production of a choral CD is a significant step forward in music making at Saint Fin Barre’s Cathedral as the last time the choir was recorded was on an LP conducted by Andrew Padmore in the 1980s. The CD is being sold to raise funds both for the choir and also for the Simon Community in Cork. Speaking at the launch were the Dean of Cork Very Rev’d Nigel Dunne, the Cathedral’s Director of Music Mr Peter Stobart, RedFM presenter Mr Neil Prendeville, UCC’s Adjunct Professor of Creative Writing Cónal Creedon, and Trudy McQuaid from Cork Simon. The Deputy Lord Mayor of Cork, Fergal Dennehy opened proceedings, thanking the people of the Cathedral and the people of Cork for supporting the Cork Simon cause and for turning out in such huge numbers. The Cathedral had approximately 500 people in it and consequently some late arrivals unfortunately had to be turned away. 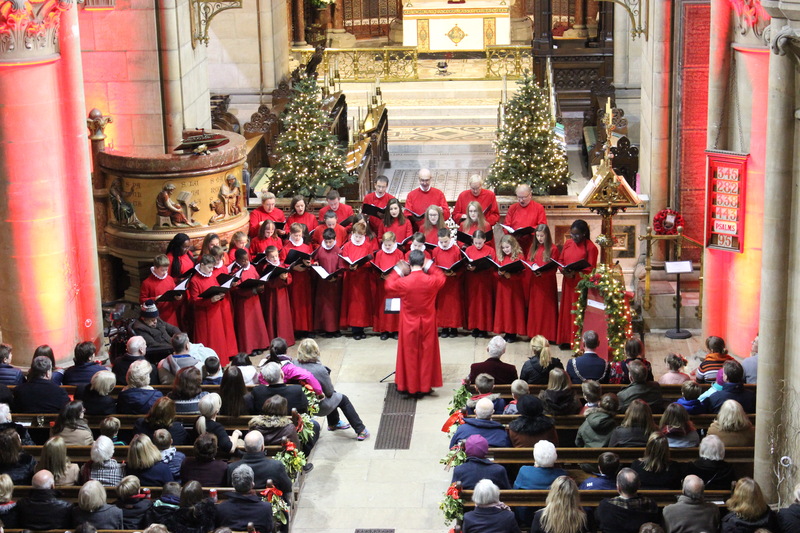 The Cathedral Choir initially performed four carols from the CD accompanied by Assistant Director of Music Ms Phoebe Tak Man Chow on the organ. One of these was in fact the world premiere of a carol written by Mr Peter Stobart especially for the CD and it gives the CD its title: A night full of promise. In an interview with Neil Prendeville, Peter explained that he was following in a tradition of carol writing and of composing sacred music for cathedral choirs, but without trying to be avant-garde in any way. The carol had been written with the voices of the Cathedral Choir in mind, and when it was performed this came across, along with the choir’s obvious enthusiasm for the whole project. The Cathedral had been decorated (prematurely of course) for Christmas and the atmosphere was indeed festive. The audience participated lustily in three further carols led by the choir and encouraged to do so by the Dean of Cork. Copious amounts of food and drink were on offer, perhaps in order to encourage CD buying! Whilst the launch was very successful, the effort and support needed to sell the remaining CDs is enormous. The CDs can be found across Cork City including Golden Discs, Oasis, Liam Ruiséal, Pro Musica, as well as Saint Fin Barre’s Cathedral shop. This entry was posted in Cathedral, Charity Work, Christmas, Church in Society, Church Music, Community Involvement, Diocesan Church Music Scheme, Launch. Bookmark the permalink.